A PORTION OF HONEYBEE BRAIN has been digitally reconstructed by a team of researchers, and it is flying a quadcopter across rooms. With nothing but the cognition of this buzzy brain intelligence, the drone is able to recognise checkerboard patterns on the wall and it can autonomously travel across the room and land gently on the ground. A group of researchers from the Universities of Sussex and Sheffield have been working hard on what they call The Green Brain Project, a project that recreated regions of bee-brain involved with sight and scent and uploaded their simulation–which is complete with thousands of virtual neurons– into an unmanned quadcopter. Speaking to BBC, University of Sheffield’s James Marshall discussed the incomparable complexity of bees and other insects, most of all their cognition. “If we could even recreate a fraction of their abilities in a robot system then we would have made a tremendous advance.” Encouragingly, their drone was able to take off, navigate itself down a corridor, and safely land, with no help or guidance from its human creators. Another time, it was able to recognise checkerboard patterns, and use the pattern to guide itself. Cameras were placed on the drone and wired into the artificial brain region. Most startlingly, when observed on computers displaying the simulated neuronal activity, checkerboard patterns were being recognised and perceptually formed in the virtual neurons. 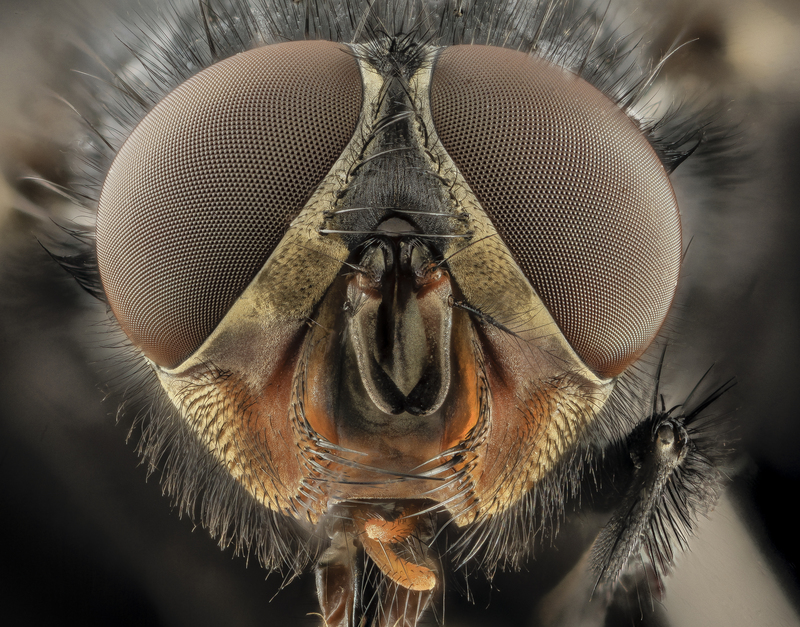 Head of a Calliphora vicina, face view. Image: USGS Bee Inventory and Monitoring Laboratory. However, while robots are used for some of these tasks already, researchers at Harvard believe that mimicking the physical and cognitive robustness of insect groups, and coordinating large numbers of smaller, more agile robots will allow us to accomplish these tasks more efficiently and more reliably. We are at the dawn of a robobee revolution here, people. It is an exciting and encouraging prospect, especially when considering the damning statistics regarding honeybee populations on a global basis, and its potential impact on global food security. Let us hope for continued advancement. We might need it.